Wooden tulip bowl spoons in assorted sizes. Handmade in cherry wood in our Vermont studio from local hardwood. 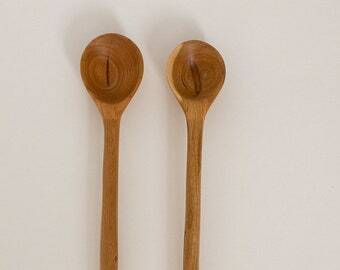 Wooden tulip bowl spoons in assorted sizes. Handmade in cherry wood in our Vermont studio from local hardwood. Sanded satin smooth and finished with food-safe flaxseed oil. Great for serving condiments and sauces. 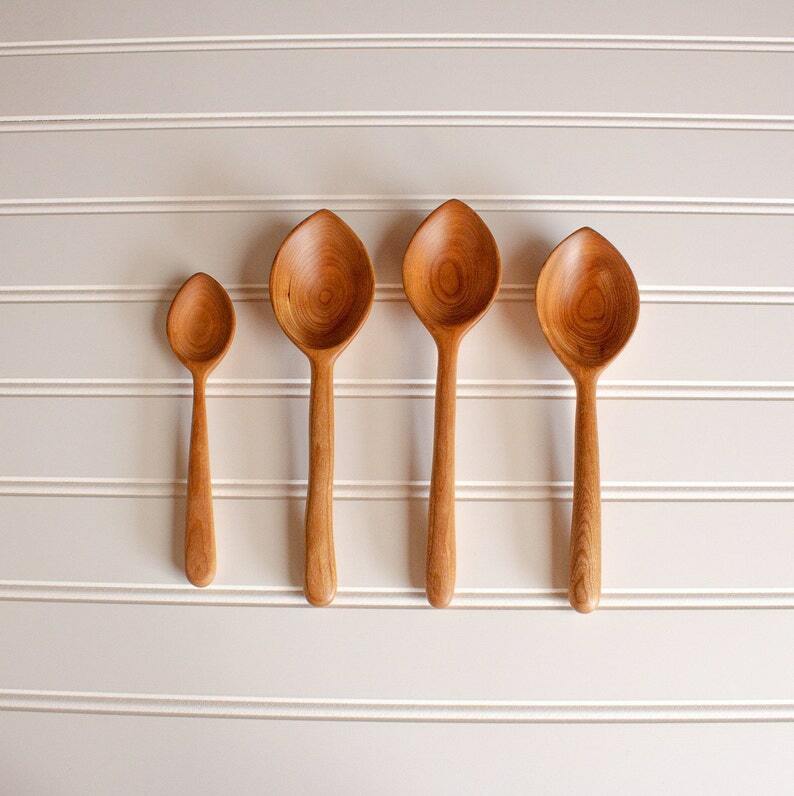 Wooden round bowl spoons in assorted sizes. Handmade in cherry wood in our Vermont studio from local hardwood. Wooden cooking, tasting and tall jar spoon handmade in cherry in our Vermont studio. Wooden cooking, tasting and tall jar spoon handmade in birch in our Vermont studio. Wooden cooking, tasting and tall jar spoon handmade in light walnut in our Vermont studio. What a gorgeous spoon! Beautifully done, quality made, and I can't wait to use it. The quality of this piece is stunning, I haven't seen anything like this before. The wood, the design, the silky touch and it looks so well made. Also, the communication was very good, always helpful. I will buy more in the future for sure. I bought a long spoon and also the pie server. Oh they are so beautifully made, and the 'feeling' of them is balanced and nice. I say, if you cook, you can use any old spoon, or a piece of craft like this. Also the pie server is slightly sharpened at the point, and made in a way that it functions very very well to pick up a piece of pie. Wood cooking baking and serving spoon handmade in your choice of local hardwood. Cherry, dark walnut or ambrosia maple. Natural, recyclable packaging is very important to us. We send the spoons wrapped in natural colored acid-free tissue paper with a Vermont Spoon logo tag tied with baker's twine and how to care for your spoon printed on the reverse side. Box filler is natural crinkle cut paper shred and packed in a brown/white cardboard box. If you would like gift wrapping services, please convo Ellen. All spoons arrive tied with a logo tag and care instructions for wooden spoons on the back. Care instructions are as follows: wash by hand with mild soap and water, then dry with a soft cloth. Never leave your spoon in standing water. Sorry, we no longer do custom orders, but ask us what we have in the shop- it might just not be listed yet. We can also add holes to most spoons to make colander/ strainer spoons. 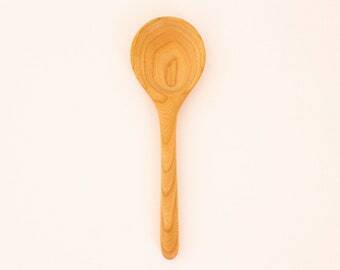 Small wooden salt or spice spoon in cherry with beautiful grain and smooth finish.